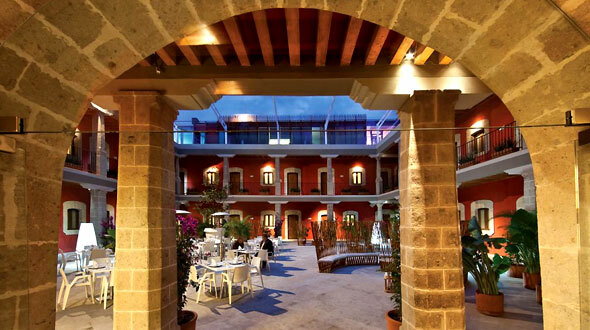 The history of the Hotel de Cortes dates back to the 1680s when the Augustinian order bought it to lodge their monks arriving from Europe. It functioned as such until the 1860s when it was overtaken by the government and sold to the private sector. It remained as a lodging house until 1943 when it opened as a full service hotel. Walking into the hotel is like transporting yourself 200 years in the past. Its 28 luxurious rooms are furnished with a convents austerity but ensuring that the latest technologies, facilities and comforts are available to all guests, including high speed internet. Our patio hosts our renowned restaurant functioning all year round serving traditional Mexican an international cuisine. We invite you to forget the worries of the largest city in the world in a place that helps you forget that the city exists. Additional information: Children age 12 and under stay free in the room with parents and in existing bedding. Children over this age will be considered an adult.